It’s hard to believe it’s been three weeks since I got my 42 mm Apple Watch Sport with white sport band. It already feels like an indispensable part of my daily kit, along with my iPhone and wallet. Move: This is based on active calories. This seems to be measured based on heart rate (measured every 10 minutes and measured continuously during workouts) and movement. Apple Watch offers to update the goal weekly based on past data. Exercise: This is based on minutes with elevated heart rate. The goal is 30 minutes a day. Stand: This measures the number of hours where you have stood up and moved a little. The goal is 12 hours a day. They’ve gamified fitness in a way that isn’t really gimmicky. Since getting the watch, I’ve been more mindful of standing and moving more during the day, as well as getting some exercise in daily. The Activities app gives very occasional updates on my progress during the day, and it also reminds me to stand up and walk around every hour. I used to use my iPhone’s motion coprocessor (introduced in iPhone 5s), but it was less than ideal for several reasons. I always had to be paranoid about keeping my phone on my person; otherwise, I’d be uncredited for some activities. It also wasn’t good at tracking exercise and workouts effortlessly, as I had to enter those in myself. With Apple Watch, I can do my hourly one-minute walk without having to worry whether my phone is on me or not. 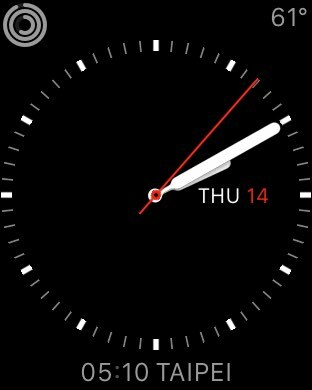 Apple calls each of the widgets “complications” (a term from the horology world). 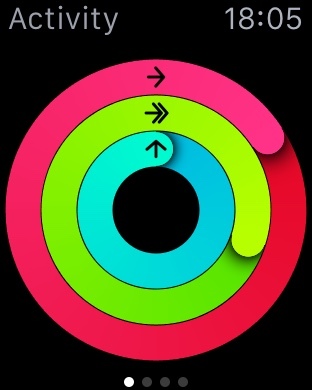 Going clockwise from the top left, I have activity, weather, and world time on my watch face. Each can be customized to display an array of options (sunrise/sunset, next calendar event, alarm, timer, etc.). I found these to be very useful, and I love that I have access to these bits of info handy whenever I raise my wrist. The watch, being an all-day wrist-worn object, is very different from the smartphone. It is much more intimate and immediate. This means that any notifications that are surfaced on the watch will be much more immediate to you as a user. The immediacy is a double-edged sword, though it, when filtered and managed correctly, can help make sure you notice the important notifications. This meant I had to more aggressively filter out some notifications so that they wouldn’t get to the watch. Otherwise, I’d be flooded by notifications. Many notifications, like ones from iMessage, are also actionable, which means I can fire off quick responses from a list of options. The immediacy of notifications is also surprisingly discreet. We’ve all seen that scene in movies where an assistant comes in during a meeting to pass a note or whisper something to the boss. The Taptic Engine in Apple Watch is just like that. When notifications come in, it just discreetly taps you on your wrist (I have mine on mute almost all the time, so it doesn’t make any sound). The watch’s screen doesn’t light up unless you lift your wrist to look at the notification, and the phone doesn’t vibrate or play a sound either. It really is invisible. I can choose to ignore or look at it depending on social context. The wrist-worn nature of Apple Watch also has much less friction compared to smartphones. It’s the same reason wristwatches gained popularity and pocket watches are rarely seen. Being wrist-worn also means it can’t replace a smartphone (as long as it’s based on touchscreen technology on a <2” screen). Any interaction more than 10 seconds feels cumbersome on the watch because holding the wrist at chest height with the upper arm extended away from the torso gets uncomfortable. I find Apple Watch to be very comfortable to wear throughout the day. Battery life of the watch has not been an issue at all, and I routinely get at least 16 hours of use without it dipping below 20%. It’s good enough that I stopped using the battery percentage complication after the second day. I’ve found that the watch does make my iPhone’s battery life noticeably worse, since glances, watch apps, and some notifications do run code on the phone whenever they’re displayed on the watch. I do have chargers at work, in my car, and at home, so it hasn’t been a deal breaker for me, but it does mean I need to be more mindful of when I’d be away from a charger for an extended period of time. Overall, I’m very pleased with Apple Watch. It’s an amazing v1 product and probably the best gadget Apple’s ever made. The engineering and industrial design is very impressive, and it shows that they’ve put a lot of thought into the UI. Right now, Apple Watch isn’t something that anyone needs (just like the iPhone in 2007), but it sure is nice to get a glimpse into the future.